A highly detailed chart of part of the Potomac River. Potomac River Sheet No. 2 From Piney Point to Lower Cedar Point. 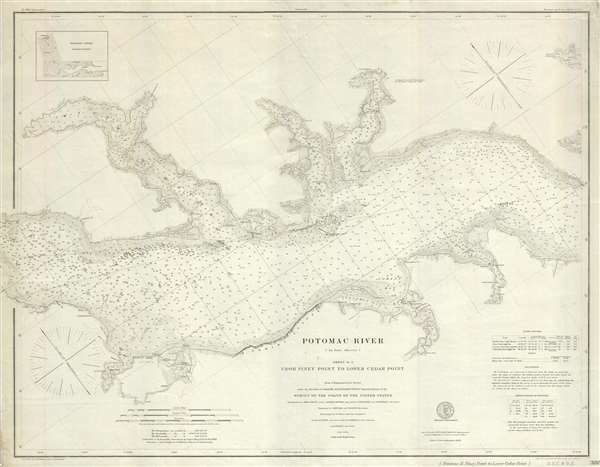 This is an 1877 U.S. Coast Survey nautical chart or maritime map of a section of the Potomac River. The map depicts the region from Lower Cedar Point to Piney Point and from Leonardtown, Maryland to Wakefield, Virginia. Highly detailed, myriad depth soundings, measured in feet, are present throughout. The Wicomico River, St. Clement Bay, and Breton's Bay in Maryland and Nomini Bay, Currioman Bay, and Mattox Creek in Virginia are all illustrated and labeled. Numerous points, beaches, creeks, and individual homesteads are also illustrated. Information concerning lighthouses, tides, depth soundings, and certain notations used on the map are situated in the lower right corner. This map was drawn by L.D. Williams and A. Lindenkohl, engraved by A. Maedel, H.S. Barnard, and A. Peterson, produced by the United States Coast Survey, and published in 1877 while Carlile Pollock Patterson was Superintendent of the United States Coast Survey. Carlile Pollock Patterson (August 24, 1816 - August 15, 1881) was the fourth superintendent of the United States Coast Survey. Born in Shieldsboro (now Bay St. Louis), Mississippi and the son of the American naval officer Daniel Todd Patterson (1786 - 1839), Carlile joined the navy as a midshipman in 1830. He graduated from Georgetown College in Kentucky as a civil engineer in 1838 and was attached to the U.S. Coast Survey from 1838 - 1841. In 1841, he was commissioned as a lieutenant. As commander of the Coast Survey schooner Phoenix, Patterson led the first USCS hydrographic expedition of the Gulf of Mexico in 1845. Patterson resigned from the Navy in 1853. At the outbreak of the Civil War in 1861, Patterson returned to federal service as a civilian hydrographic inspector in the Coast Survey, in charge of the charting and survey work. He was appointed as the Superintendent of the U.S. Coast and Geodetic Survey in 1874, a post he held until his death.